Over the last week Magic’s hot topics haven’t had too much to do with hot cards or hot prices. WotC’s announcement of the…oh, what the hell is it called. “MTG Arena Mythic Invitational.” Sure. Anyways, their announcement of the invite list incited quite a bit of bile. 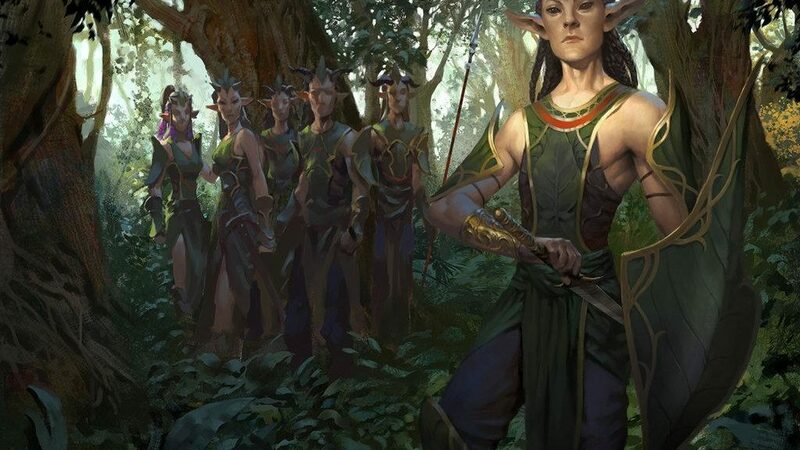 While a chunk of the invites went to those who had earned slots on MTG Arena, several went to “personalities.” This ranged from LSV, someone that I’m confident most players feel deserves to compete, to Hearthstone streamers, a subset that hasn’t particularly “earned” a slot in the highest EV Magic tournament to date. Amusingly, LSV probably loves that those people got invited, because now 25% to 50% of the room is at an FNM skill level while playing for tens of thousands of dollars per finish. TRGR, as they say. It’s an unfortunate fact that the top slots on EDHREC for black are basically all tutors. Demonic Tutor, Diabolic Tutor, Vampiric Tutor. These are bad cards in the format and if you play them you should feel bad. This isn’t the first time I’ve made this pitch though, so I’ll cut it short. After those three tutors, in 7th place is Sidisi, a de facto Demonic Tutor. 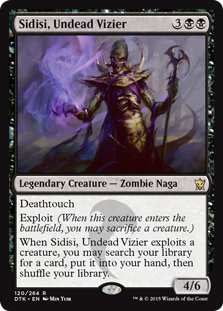 EDH players love their tutors, and Sidisi gives you a lot to work with. He comes with a reasonable 4/6 body, can be tutored with effects similar to Chord of Calling, is easy to reduce his total cost, provides a sac outlet when you steal an opponent’s creature, etc. There’s a lot there to appreciate. Sidisi is without a doubt already popular, and his price (almost) reflects that. I don’t care for non-foil copies, but foils are worth considering. You’ll find them at about $15 to $16 each on a few sites. Supply drains quickly as you scrutinize inventory, and it’s not long before you’re finding vendors charging $20+ a copy. With Tesya’s recent popularity, Sidisi is going to find a whole new slate of players that are in the market for a high-value sacrifice enabler. Supplies are strained and there’s no surplus of copies on the horizon. $15 is a slightly high buy-in price, but I suspect we’ll see prices in the $25 to $30 before long. Along the lines of Sidisi, Dark Petition is a Demonic Tutor that requires a bit of work to be Demonic Tutor. In Sidisi’s case you’re getting the tutor attached to a 4/6 body (which makes it abusable in the right circumstances). In Dark Petition’s case, it’s at best a Demonic Tutor, but the work necessary to get there is considerably less, especially in EDH, where you’ll have spell mastery reliably once you’re out of the first few turns. For the type of jerk playing multiple Demonic Tutors, it’s one of the easiest second copies to play. Petition is in about half as many decks as Sidisi, surprisingly. One may expect that spell mastery would be easier to trigger than the exploit trigger on Sidisi. I suspect that Sidisi’s abusability – copying the trigger with Teysa, blinking her for repeated effects, being able to tutor or reduce her cost – make Sidisi more desirable in decks looking to play unfairly. Still, half as popular as Sidisi is still popular, with Petition finding itself in about 11,500 lists. While you’ll pay $15 to get in on foil Sidisi, Petition is a relative bargain, with copies beginning in the $5 and $6 range. I’d call supply on Petition ‘moderate.’ There’s probably 40 to 50 foils floating around on TCG right now, so it’s not going anywhere in the next few weeks. Still, we’re talking about probably the second or third best Demonic Tutor in EDH, and supply isn’t going to keep up with that forever. There’s also always the outside chance that someone figures out a Modern brew that makes use of Petition. After all, spell mastery is trivially easy to trigger in that format, so the real question is whether your combo deck is hitting the five mana prior to casting Petition easily. Alright, no more tutors this week. I wanted to find something for Standard or Modern to talk about, but nothing jumped out at me. Pteramander jumped out at me as a possible sleeper foil, but they’re $15, so never mind there. Nexus is probably about as expensive as it’s going to get, and nothing else seems lined up to spike. I’m hopeful we’ll see some fun lists come out of Modern, but none of the latest MTGO lists are doing anything new and novel. Maybe some of the Twitch brews will start to permeate the membrane of greater awareness within the Magic community, but until then, there’s still a bunch of humans, dredge, delver, and lantern. Anyways, Myr Battlesphere. You may be shocked to hear that Battlesphere shows up in something like 14,000 recorded lists. If you’re shocked to hear that, you probably haven’t played much EDH. Battlesphere comes down fairly easily, especially as an artifact, since you get cost reduction bonus’ on two card types. It’s got that army-in-a-can effect, with four bonus bodies hitting the table alongside it, you can use the myrs it comes with – and possibly copy or otherwise create more of – to give it some serious power, and the ability to fireball people right in their dumb face means you may be able to close out games against opponents that you otherwise wouldn’t find victory in battle against. There’s only six – 6 – foil NM copies on TCG right now, each $10. After that it’s a bunch of foreign language copies at a significant markup. I don’t see any parituclar event on the horizon that would cause Battlesphere to spike, as it’s not really a Teysa or Nikya card specifically, but with supply this low, all it’s going to take is one person deciding to drop $50, and then they basically get to set the new price.